All transactions are safe and secure with a reliable history in online purchasing behind each of our associates. 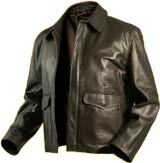 Buy the Indiana Jones Leather Jackets to own Indiana Jones clothing and merchandise. If you're going to wear something over your favorite Crystal Skull Indiana Jones t-shirt, there's nothing better than an Indiana Jones Jacket. Peter Botwright designed the original Indy jacket, and his company, Wested Leather, continues to make authentic replicas in an array of sizes. If you want to go authentic, make sure it was made by Wested when purchasing. Wear one with your Indiana Jones hat for a highly realistic looking Indiana Jones costume. In addition to the Indiana Jones Leather Jackets above, browse the Indiana Jones Clothing Gallery for more apparel like men's and women's clothes, kids shirts or hoodies.